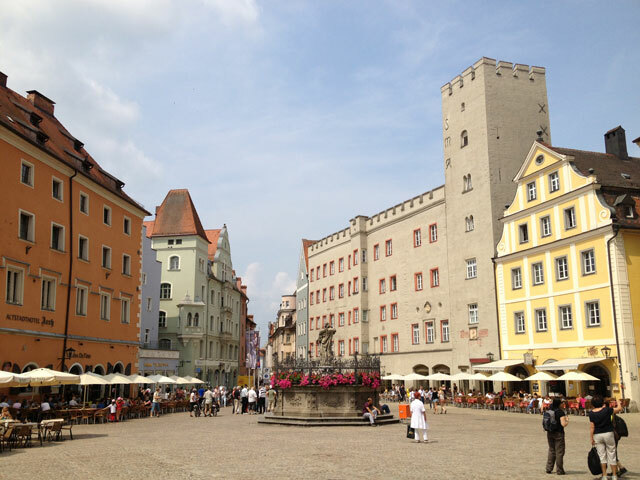 The only thing Jean Michel remembers about Regensburg when we went there about 15 years ago is eating sausages and sauerkraut in the oldest roast sausage restaurant in Germany on the banks of the Danube! He wants to go there again. I vaguely remember the restaurant episode but have no other images in my head. 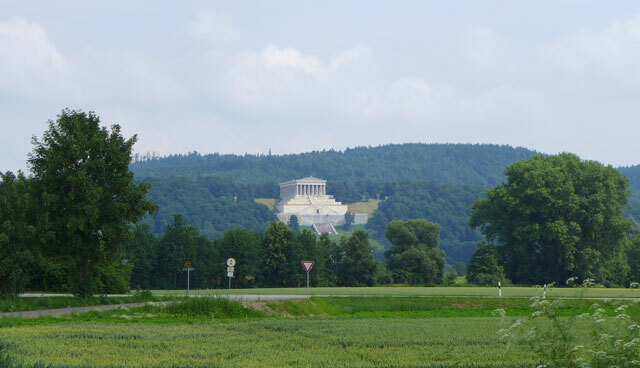 On the way, we drive past the Walhalla, which we both remember, because we passed it several times on our previous trip. Built at the instigation of King Ludwig I of Bavaria between 1830 and 1847 overlooking the Danube, it is a hall of fame for distinguished people in German history. 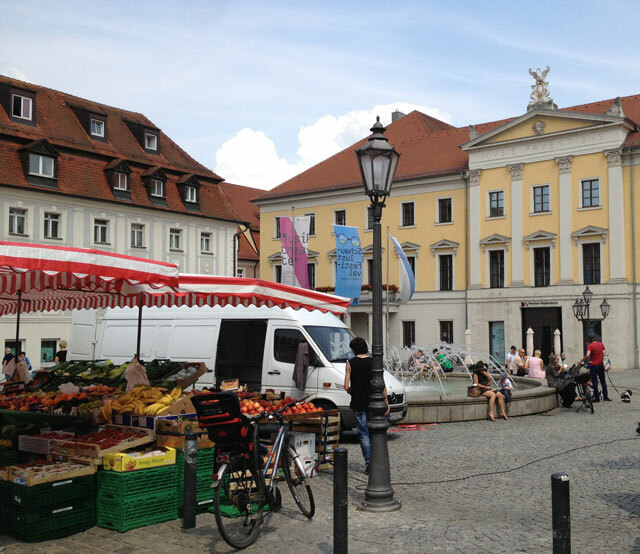 We arrive in Regensburg late morning and park in Bismarckplatz where there is a fresh food market. We buy cherries, raspberries (himbeeren) and cheese and leave them in the car. Unfortunately no one is selling wine. 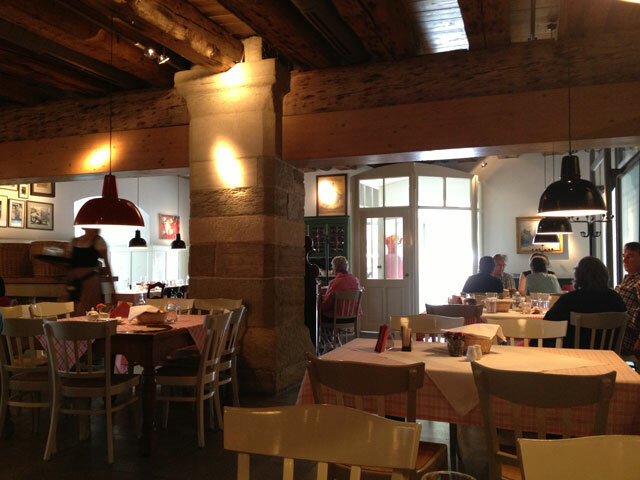 Our visit culminates in the famous restaurant, Historische Wurstkuchl, built in the 12th century to feed the local dockers and builders. Despite the fact that it’s 1.30 pm, the outside tables are crowded so Jean Michel suggests we eat inside. 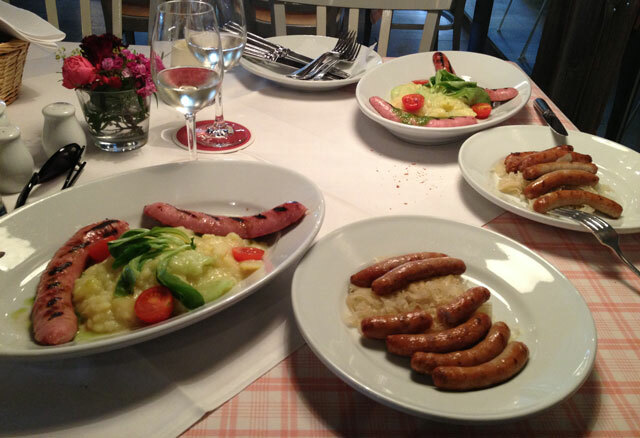 The menu is in German so with the help of my less than usefu dictionary on my l iPhone, we decide we’ll have the basic dish of six little sausages with sauerkraut and another dish which appears to include salad. The waiter, who speaks only very basic English, is rather dubious about our choice, but he checks we want everything at the same time and off he goes. When four plates arrive, two with little sausages and two with two large sausages and a large amount of potato salad with a couple of leaves of lamb’s lettuce on top, I understand his reticence! We laugh and eat them anyway. We’ll just have vegetables and fruit for dinner. 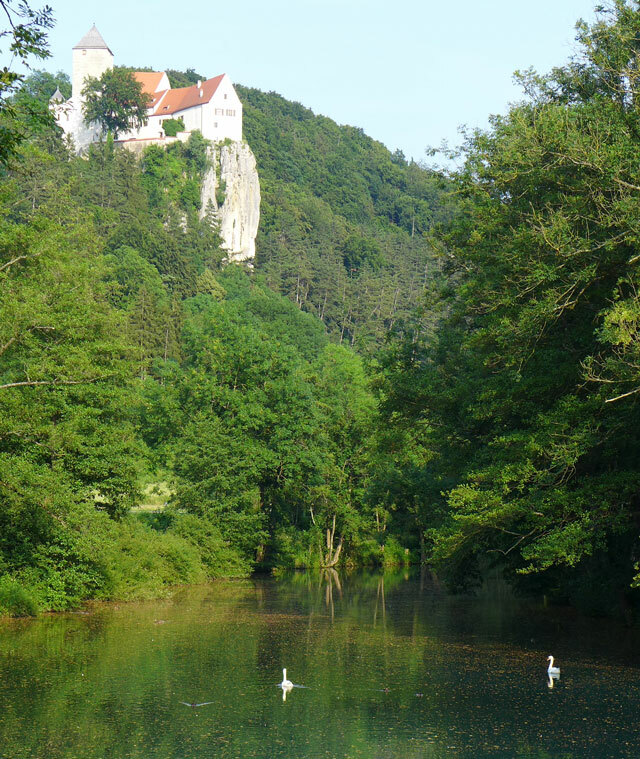 It’s 2.30 by the time we leave to cycle along a tributary of the Danube, the Altmuhle. I doze in the car after the 25 cl glass of reisling and all that food. 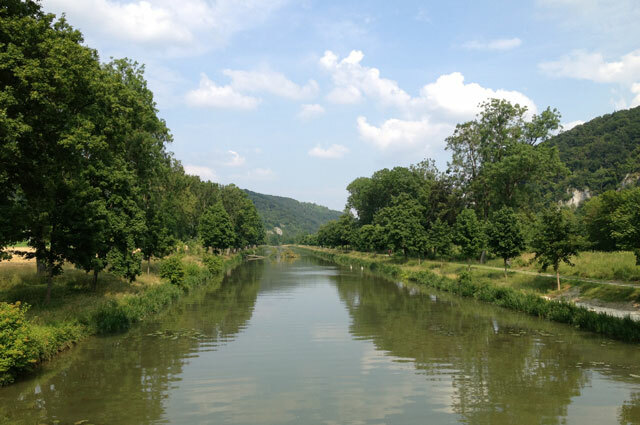 Between Kelheim, where it meets the Danube, and Dietfurt, the bed of the Altmuhle was straightened and incorporated into a canal connecting the Main and the Danube. It’s a favourite with local Germans and tourists, so we aren’t the only ones on the bike path. 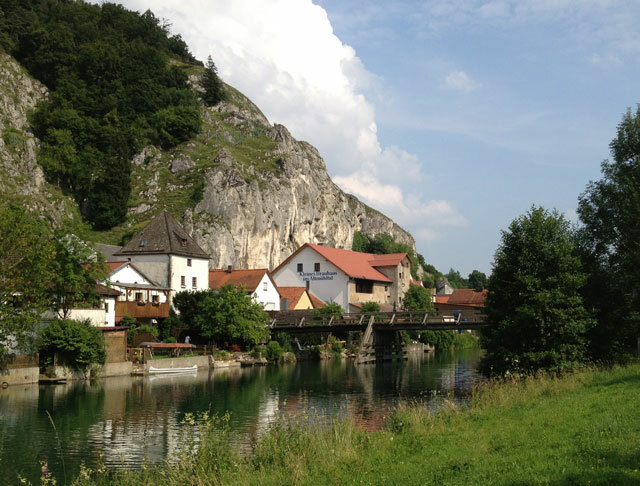 We stop off at the pretty little village of Essing to see the wooden bridge and have a coffee at Gasthof Schneider, which is famous for its local beer. We then push on to Riedenburg, which offers a plunging view of the Danube, after unnecessarily riding up a long hill due to poor signage again. Finding our way back is much easier. We stop at least six times before Jean Michel takes what he considers is the definitive photo of Prunn castle we can see high up on a hill. The path takes us past the bridge on the opposite side of the village of Essing and the six o’clock light gives a perfect reflection of the little church in the water. 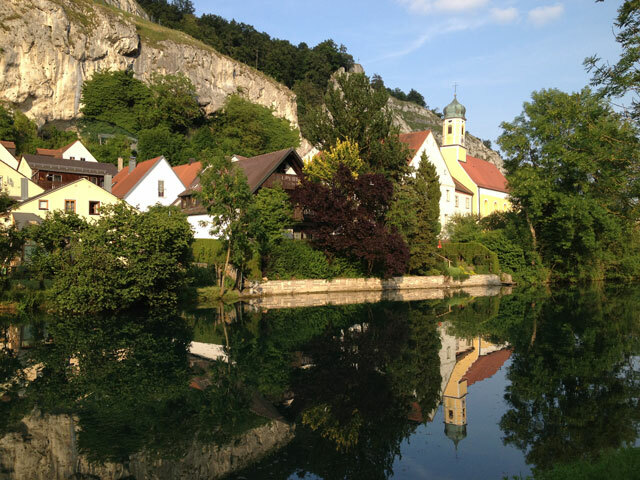 Once again, we marvel at how many different experiences our cycling trip along the Danube has to offer. 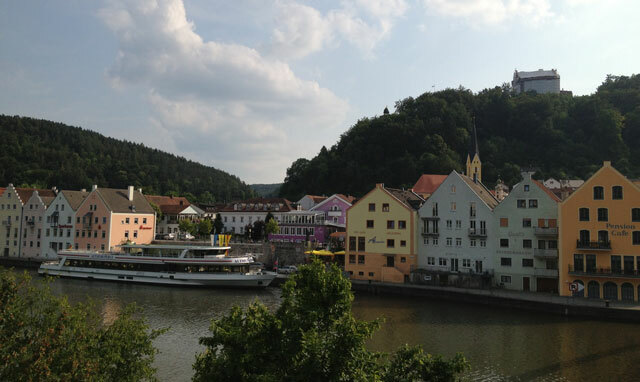 Cycling along the Danube – Watch out for trains! 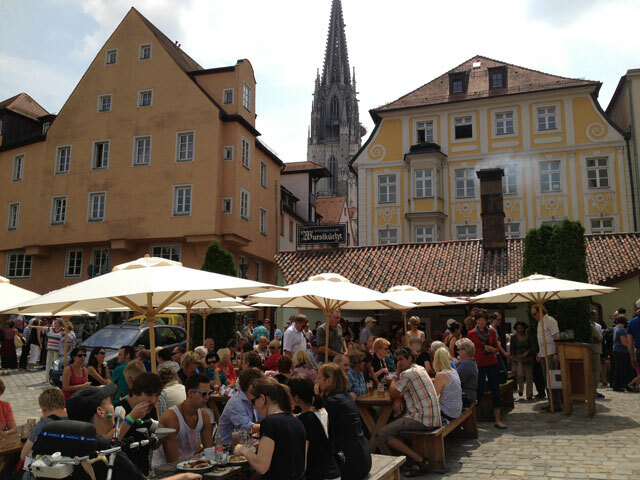 This entry was posted in Cycling, Germany, Restaurants, Sightseeing and tagged Altmuhle, cycling, danube, Essing, Regensburg, Wurstkurchl. Bookmark the permalink. Wow! You cycled after all that food!! That’s proper stamina. It’s the wine that’s worse I reckon. Today was a fast day and we cycled 54 kilometers – much easier! Thank you Denise! Fortunately, we haven’t been eating them very often.